November is a month of ‘thanks’ and to recognize all that we are thankful for. 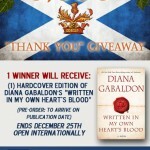 So what better way to celebrate being thankful for the greatest book series of all time, than with an Outlander-inspired giveaway?! 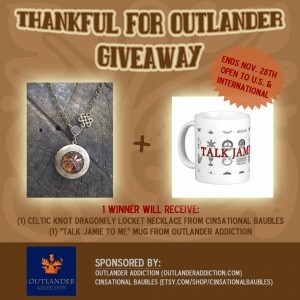 The winner of the ‘Thankful for Outlander Giveaway’ will receive a gorgeouse Celtic Know Dragonfly in Amber (inspired) Locket Necklace from Cinsational Baubles, AND a “Talk Jamie to Me” coffee mug from Outlander Addiction. The giveaway begins now and will run thru Thursday, November 28th, 2013. Giveaway is open to US and international fans. Void where prohibited. Must be over 18 to enter. Click Here to purchase the “Talk Jamie to Me” mug, or go to http://www.zazzle.com/outlander_addiction for other great Outlander-inspired products. Click Here to purchase the Dragonfly Necklace , or go to http://www.etsy.com/shop/cinsationalbaubles for more fantastic jewelry, lockets, etc. I think the link for the giveaway is wrong, but i got it link by hitting the Facebook share button! I love this giveaway, can’t wait for the series!!! Should be fixed nowl. Thanks for catching that! Not sure how to get the link for the facebook share, but I did share on my profile page! Thanks for this great giveaway! I keep hoping that I will get lucky. That’s an awesome giveaway! Thanks so much! Love these – so thankful to have talented people to craft such amazing Outlander items! Thanks for the opportunity to win!!!! Outlander Addiction rocks!!! This an awesome giveaway! Thanks so much! I am loving this contest! Glad it’s an International give away too. I have some overseas/non-US friends that get left out of the other give aways. This is my favorite series of all times! Would Love to win this!! I shared the post on my facebbok timeline and clicked it and put in the URL that came from that, hope I did that right! Love the books and the giveaway! Outlander Addict from Wisconsin. Thank you for letting us enjoy the giveaway! Thanks so much for doing this! The necklace is absolutely stunning! Awesome! Pick me please. Thanks we will keep on reading and rereading til there is nothing left. I can’t seem to “complete the entry”, am I doing something wrong? are you getting an error of sorts? Love Jamie, the mug is so appropriate. And Dragonfly in Amber is the book that started it for me – I happened to be reading some book reviews and just had to get that book, it sounded so good – and of course then I had to go get Outlander and read that 2 – and then I had to read them both again, from the beginning! And each time a new one comes out, I read them all starting from the beginning……. And sometimes I just read them because I miss them! 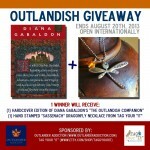 Love the Outlander books and Thankful for this giveaway!! Happy Early Thanksgiving! Have loved this series for so many years, can’t wait to see it on Starz. Great giveaway! Thank you…this is awesome! Definitely thankful for all things Outlander. This is so awesome. Got my fingers crossed. Can’t wait for the TV show. Love the book series. Great giveaway. Good luck to all. Love the dragonfly! My favorite! I hope I win! Love the necklace! How do I love Thee, Outlander Series? Let me count the ways… I love JAMMF & CBRF the most! I love their story & the lovely treats I can find through Outlander Addiction pretty dam well too! I love the thought of their timeless passion. I love the sound of “sassenach” and of “Jesus H Roosevelt Christ!”, of “Bloody Scott” and “Dinna fash”, and of the voices I imagine saying these phrases every time I re-read my favouritest lines. Sigh. THIS WOULD MAKE MY HOLIDAY COMPLETE! Thank you so much for this contest, we all love the goodies! LOVE all things Outlander!! I tweeted about give away, however can’t figure out how to get URL from my phone. Hi! thank you for this opportunity!!! Saludos!!! Thank you for the chance to win! I know exactly who I’d give that beautiful necklace to! I love the mug! Definitely have to buy some of those for Christmas gifts! I would be soooooooooo Thankful!!!! In the middle of another re-read of the series. Love re-reading them each time a new one is on the verge of releasing. Thanks so much for the chance in the giveaway! Clicked the FB button near the top and shared. That necklace would be a perfect Christmas present for my mother. She really needs a lift in her spirits right now. Not sure what the URL is but loving the giveaways! This is a lovely contest. I am thankful for Outlander. It sounds cliche but it’s true. This series has brought me joy every time I’ve read it regardless of whatever else was going on in my life. Every. Single. Time. I love the necklace. It would look so good with my Claire’s ring. I shared it as well but have no idea how to give the URL for a facebook post. I love everything Outlander! My favorite series of books ever. We just switched cable providers and Starz is included. Cannot wait for the show to start. Woo Hoo! Another chance to win! OUTLANDER! I am so thankful to Outlander! I even named my son after Jamie…pretty crazy! LOL! Thanks for doing the giveaway! I esp. love the necklace! I shared, but no clue if I posted the right url. This is a great and generous giveaway! 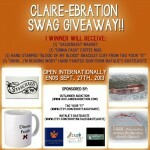 I would love the mug or the necklace, but to win both at the same time would be totally awesome! I’m thankful to Outlander and all the books (which my hubby introduced me to, by gifting me with the first book)for helping me get through his death in 2011. And also for helping me get out of the depression that followed. Still trying to figure out the Twitter stuff,but hopefully I did the rest right. Ooow! This would make the time until next book really awesome… Thanks for that opportunity! That etsy shop is really neat! I may have to snoop there for a while. Such pretties! My FB friends introduced me to the Outlander books and I love them. I am thankful for my husband, family and friends and every day that God gives me. Can’t wait for the new book and series! I want to talk Jamie to you! Great give away for the holidays. Can’t wait for the series. what a great giveaway! Thank you!! Thanks for the chance at these awesome prizes. The mug is so cute. Hope i win! These are amazing!! *. * Loved the necklace and the mug! Beautiful work…so nice to see the words come to life! I would love…love…love to win this contest. I am a Huge Outlander Fan!! These would be great to have when watching the Outlander series next year!!!! Love them. Have been eyeing this pendant off for ages! Would be lovely Xmas/Bday present! Gorgeous necklace! Thanks for the opportunity! Happy Thanksgiving! I so can’t wait until the series starts. Would love to win, thank you!!!! 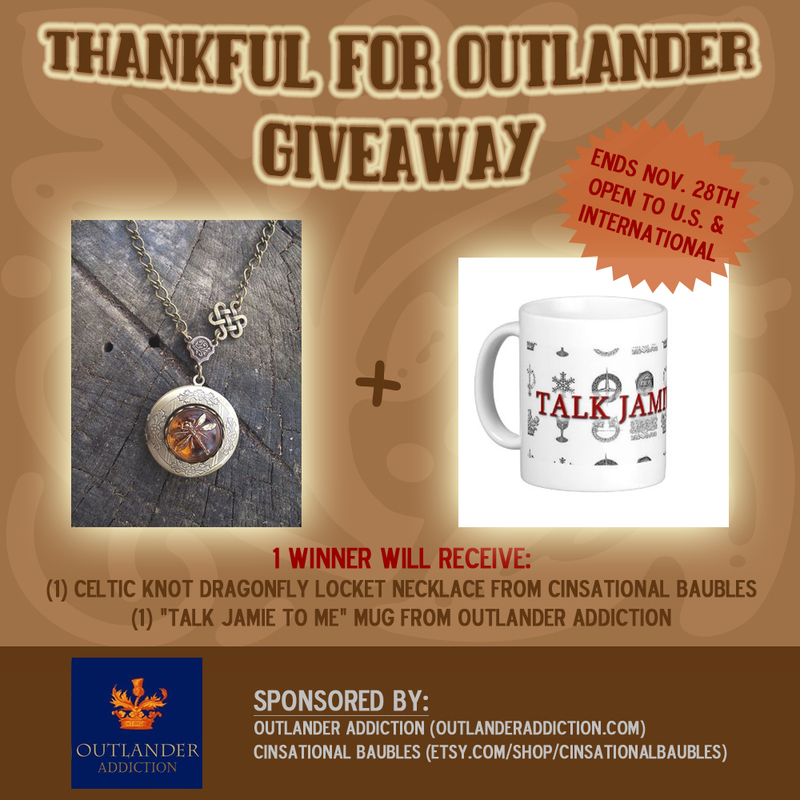 Thanks for this chance to win Outlander merchandise and HAPPY THANKSGIVING! I absolutely love the mug! Thank you for this awesome giving thanks program. Two beautiful items too. I love the Talk Jamie to Me idea, because it’s one of those things only fans of the series would understand. Hilariously amazing. Xo. I’d like to win this for my daughter who introduced me to Outlander. We love this series. Love the necklace, almost as much as I love Outlander. Happy Thanksgiving!! Thankful for DG & the wonderful books she writes! !